Over the last month we have been reviewing the Organic Milky Whites Toothpaste from Little Innoscents. 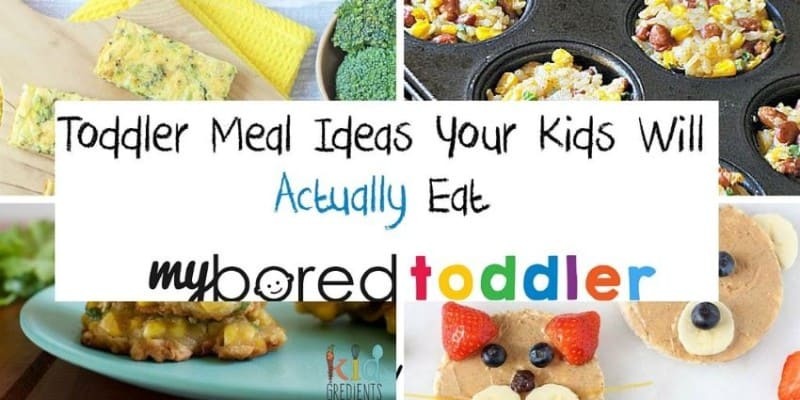 When it comes to products for babies and toddlers I am very picky. I have children who have very sensitive skin and quite a few allergies so I am always looking for natural, chemical free products. I also love supporting Australian companies. The product that we trailed was the Organic Milky Whites Toothpaste. One of the key features of this product is that it is fluoride free and contains no artificial sweeteners. Priced at $4.95 it is comparable to the brands you find in the supermarket. My children have both been using this for a month and we are all very happy with the product. They love using their own ‘special’ toothpaste and enjoy the minty taste, and I love that it is all natural. If you are looking for a more natural toothpaste solution, make sure to test this one out. You can find out more about the Little Innocents product range on their website. We also have a chance for you to win a great prize pack (see below). 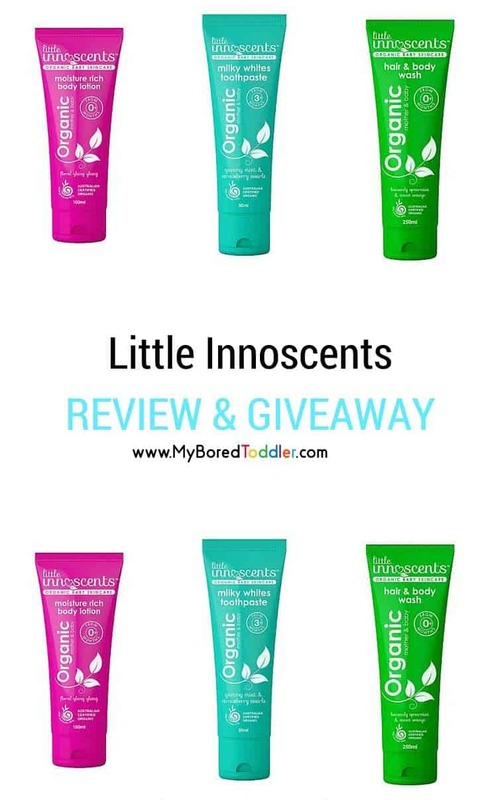 The lovely people at Little Innoscents have kindly offered up 5 prize packages for our Australian readers, each consisting of the Organic Milky White Toothpaste, Organic Hair & Body Wash and the Organic Moisture Rich Body Lotion. Each pack is valued at $30. If you would like to win one of these great prize packages, please tell us in 25 words or less why organic ingredients are important when choosing products for you child. Entries close 21 April. Australian residents only. They’ll be exposed to enough chemical in life. A NATURAL fresh start is best! so teach these little people the right way! I try to always use organics for myself so why would I do any different with my beautiful natural bubs. With organic ingredients there’s no harsh chemical that will be harmful to your love ones, you can use it with ease of mind. Natural ingredients and no harsh perfumes are the most important thing when choosing kid products. I only ever want to use natural products that are safe for my childrens skin. 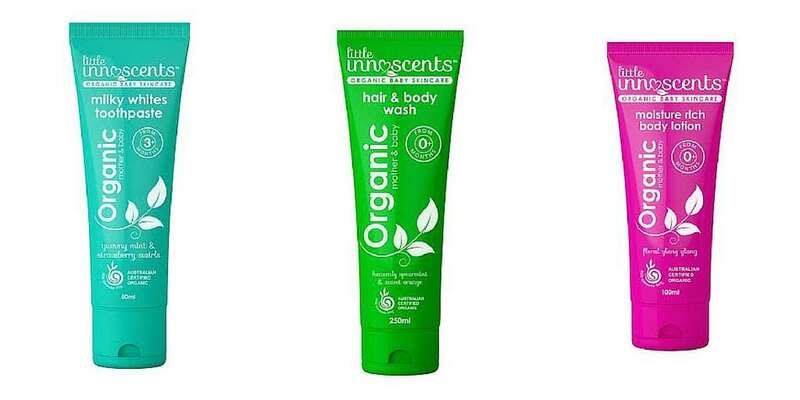 Using organic products feels like I am giving my children a healthier start. It makes me feel like I’m doing the right thing when I choose to buy organic. It’s a decision that gives me peace of mind. Because my three all suffer from eczema, and the lower we can keep their chemical load, the better. Especially when it comes to growing bodies. But still fun & fragrant. Natures beauty in a tube! We go for organic and natural simply to minimise our sons reactions to chemicals, be it in skin products or food. 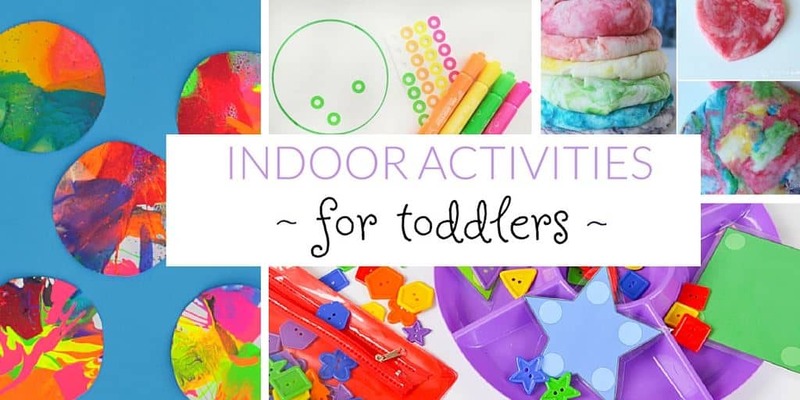 Our toddlers are already exposed to a cocktail of chemicals in their everyday lives, so anything I can do to reduce this is worth it! Little bubs have such delicate skin. I don’t want to mess with it. Organic is the way to go. I’ve suffered all my life with sensitivity and want my kids to be safe. Natural skincare products have great benefits for long term users and free nasty chemicals. She doesn’t let me skin get stressed! A wonderful toothpaste designed for children that will encourage good oral hygiene. Simple and effective.